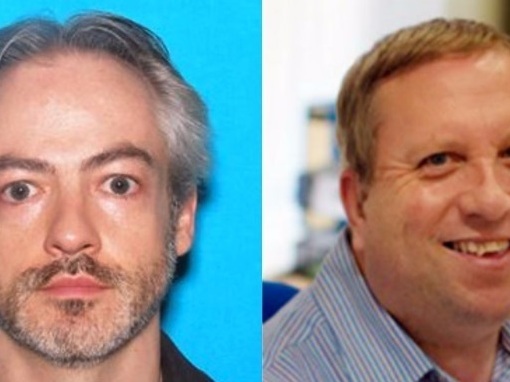 Northwestern Professor And Oxford Employee Arrested In Stabbing Death Of Chicago Man : The Two-Way Wyndham Lathem and Andrew Warren surrendered on Friday in California and are facing first-degree murder charges. Wyndham Lathem (left) and Andrew Warren were arrested Friday in California, in connection with the July stabbing death of a Chicago man. 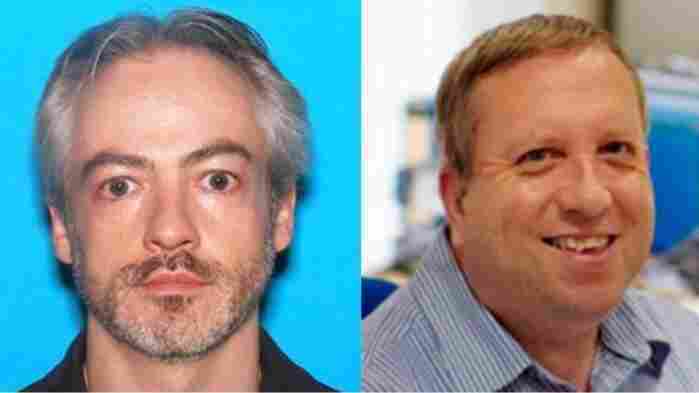 A Northwestern University professor and an Oxford University employee were arrested Friday in California in connection with the stabbing death of a Chicago man. Wyndham Lathem, 42, an associate professor of microbiology at Northwestern, turned himself in at the Oakland, Calif., federal courthouse said Anthony Guglielmi, chief communications officer for the Chicago Police Department. Andrew Warren, 56, also surrendered to police in neighboring San Francisco. Warren worked as a senior treasury assistant at Oxford's Somerville College in the U.K.
"The U.S. Marshals in Oakland have been working throughout the week with the U.S. Marshals Service Great Lakes Regional Fugitive Task Force and the Chicago Police Department," said the U.S. Marshals Service in a statement. A manhunt had been underway since July 27 when the body of Trenton Cornell-Duranleau was discovered inside Lathem's Chicago apartment says Guglielmi. The 26-year-old had been stabbed multiple times. Lathem and Warren are facing first-degree murder charges. "Both individuals will be held accountable for their actions and we hope today's arrest brings some small level of closure and justice for Trenton Cornell Duranleau's family," Chicago police tweeted Friday. "We are also thankful both men are safely in custody and this did not end in further tragedy." Before his arrest, Lathem had sent a video message to friends and family apologizing "for involvement in murder of Trenton Cornell," tweeted Guglielmi. In the video Lathem said he had made the biggest mistake of his life, according to Guglielmi. It was around 8:30 in the evening on July 27, when Chicago police said they found Cornell-Duranleau's body with "several lacerations" after responding to a call requesting a well-being check. "In the kitchen, police found a knife with a broken blade in the trash can and another knife near the sink. Blood was everywhere, the sources said. "Police said they suspect Lathem fled with Warren. Both men were seen on surveillance video at the building, police said." Police said Cornell-Duranleau had been dead for several hours when they found him. On the same day he was killed, but before his body was discovered, Lathem and Warren drove about 80 miles to Lake Geneva, Wis., Chicago Police tell The Associated Press. At the city's public library, one of the men made a $1,000 donation in Cornell-Duranleau's name. Police tell NPR that Lathem had a personal relationship with Cornell-Duranleau. Cornell-Duranleau had moved to Chicago from Michigan after receiving his cosmetology license, reports the AP. But what remains to be determined is how the two men knew Warren, or whether they knew Warren before he flew stateside from the U.K.
Lathem and Warren are awaiting extradition to Illinois. Guglielmi said that could happen as soon as next week.